Most of the problems caused in Software are due to human errors or complexity in Software functions. These problems always get resolved with each new release of Software if they are well addressed. That’s why we always have to keep close eye on Software’s release notes or issues fixed list. Some other problems are due to lack of our knowledge or not using functionality correctly . Learn some of the ‘Troubleshooting Tools and Techniques’ for DraftSight from CadOasis to cope with those problems.We will be adding new Troubleshooting tools and techniques for DraftSight here only ! So keep visiting this page. This is the first thing you must know to use DraftSight. Minimum System requirements for Windows OS. Minimum System requirements for Mac OS. Minimum System requirements for Linux. Note: Virtual machines, such as VMWare, are not supported. It is not possible to either run or install the Dassault Systèmes License Server on a virtual machine. 2. Help is always Helpful ! For any genuine problem or more information always trust help files made by Software publisher, they solve almost 50% of your problems. Get the Free Community Support from DraftSight : Say what you mean SWYM . Here best technical person from Support team as well as CAD users and experts like us are ready to help in no time. And that’s the best quality support I found even if you are Free user of DraftSight. If your 30 Days activation period is over and you are not able to activate after it then you can follow this Process. Exit from DraftSight if open. Go to windows Start > in search bar Type ‘regedit’ > HKEY_CURRENT USER> Software>Delete ‘SWActivation’ or rename it. Some Display issues which are related with Graphics area or UI are due to Graphic card Problem. Always install Latest/Recommended Graphics card in System Requirements. 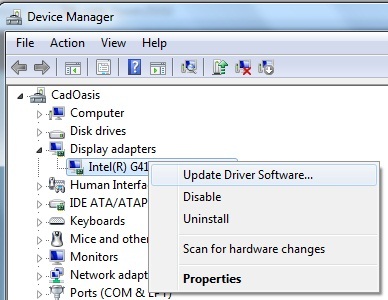 Go to Start >Search for Device Manager > Display Adapters Right click on graphics card and update Driver. This trouble shooting method is recommended when issues arises due to Some Customization , Styles and Settings in DraftSight. Make Sure DraftSight is not running and Rename DraftSight folder to any (don’t delete else all your settings will be removed and DraftSight will start with Default setting.) and Start DraftSight. It will create new DraftSight folder on this path. If you want to use some of old settings then you can point path from File locations to respective older path (ex. Print Styles). If some of the dialog boxes like New, Open, Save or Export are not pop up or if Command dialog box options shows in Command line then Run Command: DISPLAYDIALOGS if Default option is set to NO then Change it to Yes. 7. Remove Unwanted or invalid add-in message from Command line. If you see Command line error messages in DraftSight due to Invalid add-in or unable to load dll and want to get rid of these messages then use this Trouble shooting method. Go to C:\ProgramData\Dassault Systemes\DraftSight\addinConfigs and Delete such add-ins carefully or take backup somewhere and delete. 8. Enter or Change Proxy Server Settings. If you are unable to enter/change proxy settings after 30 days of Activation period. Normally at this stage DraftSight is not opened so first you need to reset activation dialog box (See Point 3 above) . Then when you start DraftSight Go to Tools Menu > Options or run Command OPTIONS > Go to System Options > General > Proxy server Settings : Enter Correct details > Apply and Ok. Restart DraftSight . Here you can change Default Type from Use named Print -Styles to Use color-dependent profile or vice versa . Below to it open Drop down list of Default Print Style to see all available Print Styles in DraftSight. You change/Create or Edit Print Styles from Print > Additional Options > Print Style table . 10. Menu Bars are not showing. This issue occurs mostly when you create new UI profile or Change some customization in DraftSight. At this condition as you are not able to Go from Tools Menu > Customize, Run CUSTOMIZE command from Command Line. If command line is not visible then press CTRL+9. Now In Customize window> UI Profiles > Expand UI profiles and Check which UI Profile is active . If any profile other than ‘Classic Default’ is active then Activate ‘Classic Default profile’ If any Case Classic default is not showing then you can Add new Workspace then Expand Menu bar section below it. Click on tab ‘Show menu explorer’ next to Menu bar column. Here you will see List of all Default Menu items in DraftSight . Select one by one and Drag it to Menu bar Column Cell. 11. How to Improve Display Quality of Circles , Arcs, Ellipses and Splines ? Specify display setting values between 1 to 20000. Larger value will make curves smoother. Now in this case you are in MODELMODE so you need to switch back to Sheet mode so run SHEETMODE command and zoom out. 13. Lineweight not showing in Model or Paper space . Another method is to Run System Variable ENBLLWTDSP > if its OFF then make it ON. 14. MacOS Users: Unable to open or Install DraftSight due to security setting. Sometimes due to security settings for downloaded apps, DraftSight users are unable to open or install DraftSight on their MacOS. In ‘Allow apps downloaded from’ select ‘Anywhere’ and Save this setting. Now install DraftSight or if you have installed it then re install it again and Open it. Revert back your security settings in ‘Security & Privacy’ tab to original for other apps. 15. Unable to Activate/ Transfer your DraftSight Professional License. 16. How to Change Default Installation Path of DraftSight? 17. How to Clean Up Drawing Files in DraftSight? Solution by Yahzdi [Thanks Yahzdi :)]: If you have an NVIDIA card try using terminal to issue ‘nvidia-settings’. If you get the GUI interface select OpenGL Settings and uncheck the Synch to VBlock option. That worked for me with DraftSight 15 and Mint 17.1. 1. Home palette links are not opening or OPENWEBPAGE command giving invalid when type webpage address: You need to make any of your browser default to open links (Internet Explorer). Add-in “DSxxx” is not registered and will not be loaded. Use “regsvr32” to register COM add-ins and “regasm /codebase” for .NET add-ins. Note: Currently at CadOasis we are not supporting Linux and Mac OS. However readers can post their comments and expect other reader with those OS will respond to those comments.